If a traffic sign that is relevant to your vehicle is passed, the system displays the information of the speed limits and no passing restrictions to the driver. When the driver turn on the ignition, the system displays stored information of the speed limit before turn off the ignition. Sometimes different speed limits are displayed for the same road. The information displayed depending on the situation. Because, traffic signs with additional sign (e.g rainy, arrow...) are also detected and compared with vehicle interior data(e.g wiper operation, turn signal...). The system can update the speed limit information without visible speed limit signs in the following situations. - When you change your driving direction with right or left or U turning. - When you enter or exit into town or village. 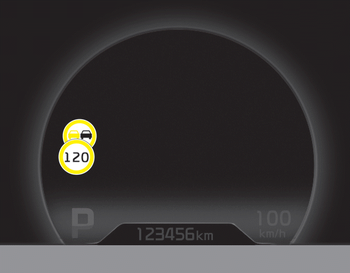 If speed limit value has the difference between cluster and navigation, check the speed unit setting in navigation.